For the average traveler, Shanghai may seem like an intimidating city to visit. And if you add in kids, the trip may seem downright impossible. I speak some rudimentary Mandarin, and I was still nervous about this week-long vacation, which we took because my husband was going to Shanghai on business. But when we finally got to the city after a 13-hour plane ride, I was surprised to find that it’s actually very similar to most major U.S. cities. I was expecting squat toilets, streets with strange smells and sights, language barriers, and disorderly traffic, but only the latter turned out to be accurate — definitely look both ways before crossing the street! In a thousand different ways, Shanghai is shaping up to be a completely modernized city. It’s clean and organized, with tons of familiar foods and shopping, and many people speak English. Of course, many people also don’t, but chances are that you’ll be able to find someone to help you out. As for visiting this city with kids, the Shanghainese don’t just tolerate children, they genuinely love to accommodate them. In most restaurants, for example, you’ll be asked if your kids would like child-size place settings. And don’t be surprised if they get a pat on the head and a big smile everywhere they go. We stayed at the Sheraton Shanghai in the Hongkou area of the city because it was near my husband's meetings. It's an extremely luxurious hotel with impeccable service (and it’s not all that expensive), but it's primarily a business hotel. There was a lovely children's park called Aisi a block away and plenty of little malls in which to find good food within walking distance. If I were to pick an area in which to stay with young kids, however, I'd choose the French Concession, which is walkable, scenic, and lined with tons of restaurants and shops. Many expats live in that neighborhood, making it easy to get around with limited English. Most visitors to Shanghai at some point end up at Yu Yuan Garden, a labyrinth of shops, food stalls, tea houses, and gardens. This is where you go to shop for souvenirs and sample street foods. 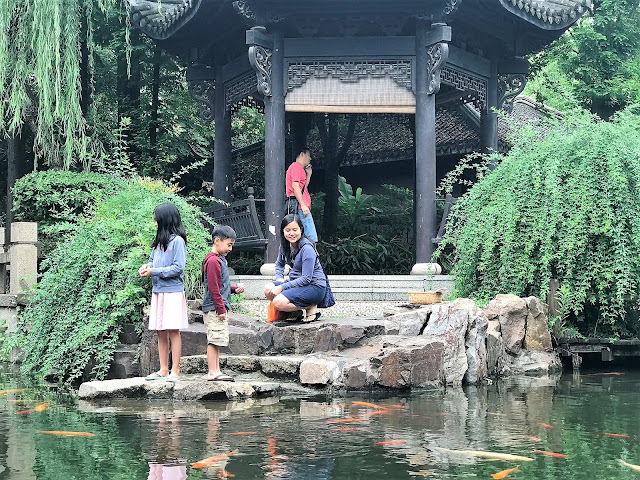 The kids got cotton candy shaped like an elaborate flower, and we filed across the zigzag bridge, peeking down at the koi in the pond below, along with a throng of other tourists. The area, with its ancient buildings and historic gardens, is both authentic and touristy at once, and it’s best to go on a weekday morning, when it’s not so crowded. Right near Yu Yuan is The Bund and the Huangpu River. Here you can find river tours of all kinds, but we decided to simply travel across the river in a ferry (15 cents per adult, kids were free) and take in the skyline that way. The kids and I spent one morning at Eday Town, a kid-centric attraction that lets children try their hand at various occupations. They earn money along the way, which they can spend on snacks and certain activities. We’ve been to similar attractions in other countries, such as Kidzania in London and Baby Boss in Taiwan. Eday Town is not as well done, but had some cute features, such as the dumpling shop (the kids made dumplings out of dough, then got to eat some pre-made ones). 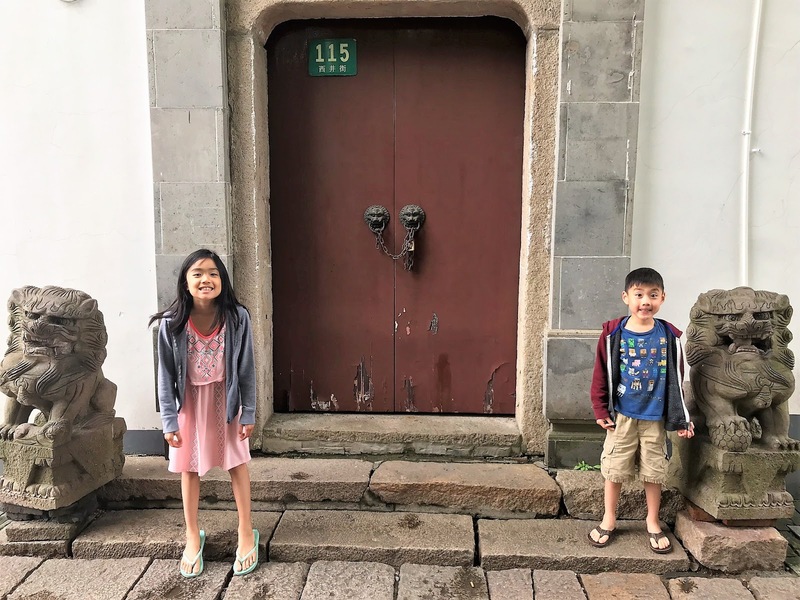 All of the activities were conducted in Mandarin, which intimidated my son (I had to sit by his side and translate for him the whole time), but I saw plenty of other foreign kids happily participating despite the language barrier. We spent another morning braving Shanghai Disneyland, which was somehow an even more harrowing experience than Disney World in Orlando. The sheer number of people, combined with a somewhat useless FastPass system (all the Fastpasses for the day were distributed within 30 minutes of the park's opening, so after that you basically had to wait on the crazy lines) made this experience less enjoyable than I expected. I will say that the park is extremely clean and brand new, and the revamped, immersive Pirates of the Caribbean ride alone was pretty spectacular and worth the price of admission (which is relatively inexpensive, compared with other Disneys). It was also fun to eat Disney's Chinese version of American food, for example the Mickey-shaped pizza topped with tiny chunks of char-siu. I booked a couple of tours for our visit, and they both turned out to be great. We really appreciated the insights and history that our guides provided us, and we learned so much about everyday Chinese life and the history and symbolism behind the sights we were seeing. The guides were always careful about including the kids and customizing our tours so they were interesting for them as well. We spent one morning with Christina from Untour Food Tours, who took us around to sample Shanghai breakfast street food (there are tours for lunch and dinner as well, including a dumpling tour that includes a dumpling-making class!). My husband and I really wanted to try the street food, but didn’t know where to start, so this was a great way to go. Our guide took us to several stands and shops to enjoy freshly made dough sticks, soy milk, potstickers, jian bing (a Chinese crepe), tea, hand-pulled noodles, soup dumplings, and mochi. It was really more of a huge brunch tour than a breakfast tour! While walking from stand to stand, we strolled through the bustling Xiang Yang park in the French Concession area (where retired locals were doing tai chi everywhere we looked), a residential alleyway, and a wet market, learning about each location along the way. As a bonus, our guide knew where all the good bathrooms were. We had such a delicious and informative time! On another morning, we toured the water town of Zhujiajiao, about an hour west of Shanghai. We wanted a taste of old China, which is impossible to find in the city. Zhujiajiao, dubbed the “Venice of Shanghai,” is a fishing village built on a canal 400 years ago that remains largely preserved today (except that now the residents are more likely to operate B&B’s than make a living as fishermen!). Tom of Shanghai Driver Guide picked us up from our hotel for our private tour and drove us there, then brought us into a wealthy family’s former estate, across ancient stone bridges, through immaculately maintained gardens with koi ponds and rice paddies, and to visit sites that look like movie sets, including a 200-year-old post office and an equally old pharmacy, both still operational yet open as tourist attractions. The kids had fun feeding the koi and clambering over all the stone steps and bridges. After the walking portion of the tour, we took a gondola ride up the Grand Canal and had lunch at a no-frills restaurant on the river, where we feasted on braised pork shank, noodles, and some local vegetables for just $24 total! Shanghai offers a hodgepodge of chain restaurants (where you can expect to pay Western prices) and mom-and-pop eateries that will sell you freshly made bowls of rice or noodles for next to nothing. We ate at both types of places. In terms of the chains, we found Haidilao to be a hoot. It’s a hotpot restaurant that’s perpetually packed, so they offer all sorts of free services while you wait for a table, from hand massages to trays of snacks to a kids’ play room. Once seated, the entertainment continues, with the wait staff bringing you everything from blankets if you’re feeling chilly to trinkets for the kids. We ordered the hand-pulled noodles for our hotpot, and a “noodle artist” in a fedora came to our table, stretching and flinging a hunk of dough into strands of noodles right before our eyes while spinning theatrically. Another favorite restaurant of mine is Din Tai Fung, which is really a Taiwanese chain that’s taken over the world. The specialty here is soup dumplings, which were invented in Shanghai, then made popular around the world by Taiwan. We ate at the Pudong location for dinner, which has a panoramic view of the Shanghai skyline. Our UnTour Food Tour brought us to several hole-in-the-wall eats around the French Concession. My favorites were Henan Pulled Noodles on Changle Lu for the scallion noodles (which you can watch being pulled downstairs), and Soup Dumplings on Nanchang Lu. Our China travels took us to Beijing for a mere day and a half, as my husband was having a meeting there as well, but that was just enough time for me and the kids to visit the Great Wall by ourselves. I booked a private driver called Mr. Ma through Viator, who turned out to be super kind and helpful, as there were certain things I couldn't do myself, like take both kids down the mountain coaster (Mr. Ma went with my son, while I went with my daughter). And yes, there is a mountain coaster that you can zip down from the Great Wall! There’s also an open-air chair lift and an enclosed gondola to take you up. The Mongolian invaders must be spinning in their graves! Anyway, we visited a section of the Great Wall called Mutianyu, which I chose because it's supposed to be easy to hike, and because of the aforementioned mountain coaster. I was concerned that the kids would quickly get bored of walking along the wall, but it turns out that this section consists entirely of ascending and descending stairs, so there was no opportunity to get bored. It was quite strenuous to climb up all those steps, and rather intimidating to climb down, but we managed without incident and took in truly amazing views the whole time.